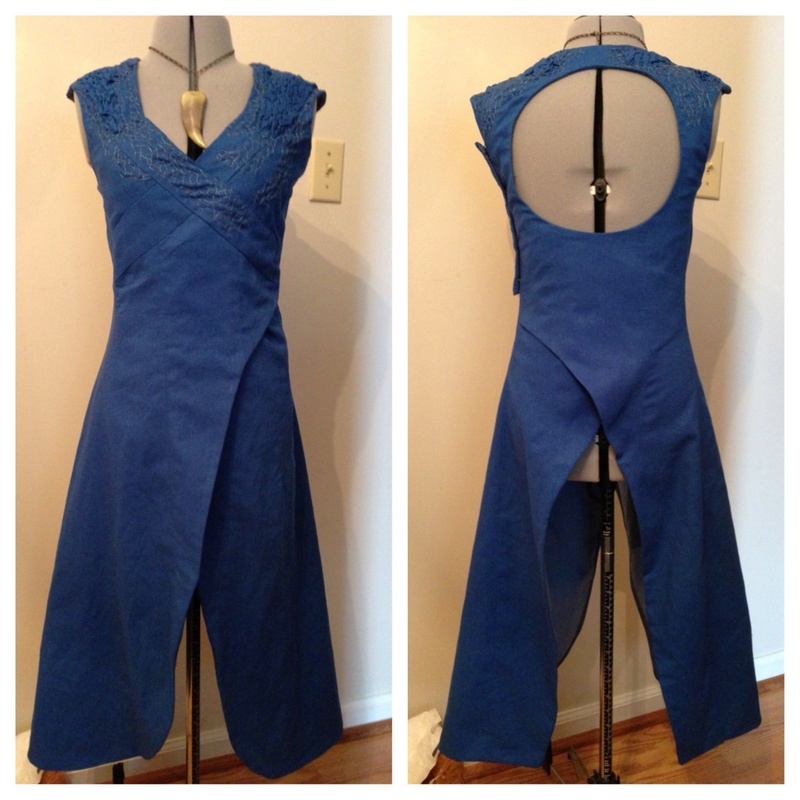 I got inspired by Peneloping a while ago to start making more of my own clothes and not just cosplays. Since then, I’ve made one Dear Creatures copy, a modified Dear Creatures dress, two skirts, five shirts, and one drapey knit jersey cardigan. I do not have pictures of the modified Dear Creatures dress and, to be perfectly honest, I am not entirely sure I am in love with it anyway. Of the five shirts, one is still incomplete; I haven’t yet pounded in the snaps simply because I am one snap pair short and the local fabric store is 15 mins via highway/30 mins via side road away. Do excuse the terrible photography about to come up. I really need to invest in some soft lights and find a spot in my house to do some decent photography. It is made from leftover jersey knit fabric from when I made a Hunger Games Clove training outfit (which I haven’t worn yet). I used Simplicity pattern 1616 to make it; this is also the same pattern I used to make the bottom half of Clara’s Bells of St. John dress. 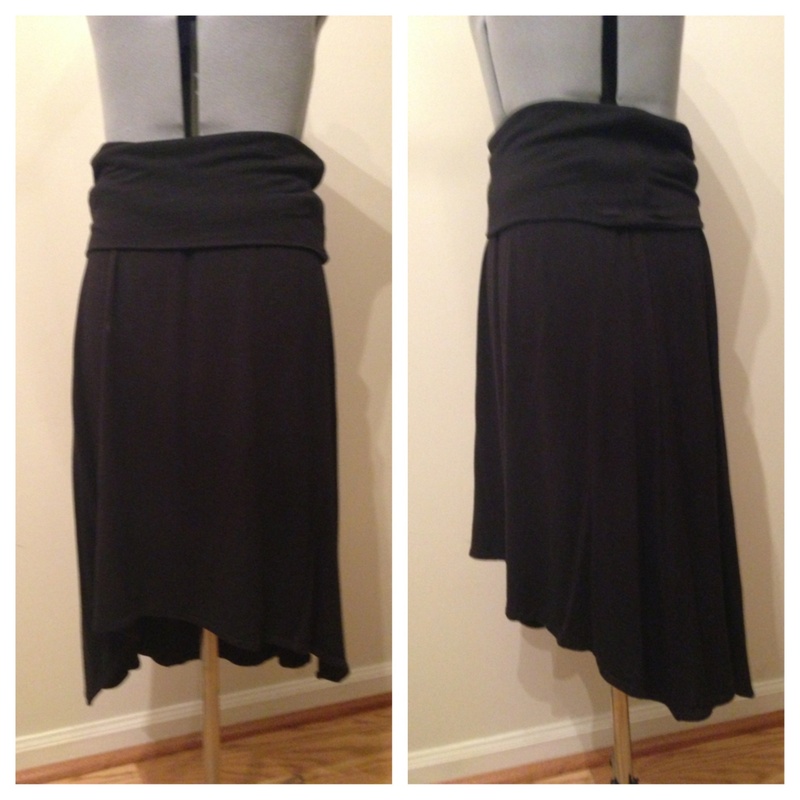 It’s a tad loose around the waist but it’s a great go to skirt. The other skirt is made from a woven cotton sateen given to me by a coworker of mine. She thought she bought enough for a dress, but the 1.5 yards was only enough for a skirt. I am in love with my Clara Nightmare in Silver skirt from Urban Outfitters but it’s too short for my statue. So I used Simplicity 2314, put a zipper in the front instead of the side, and lengthened the hem by 3 inches to accommodate the 20 inch zipper. I originally added pockets to the skirt just like the UO skirt, but I lined this one and it sits right on the hips; the pockets opened up so they were removed. Here are three of the five shirts. All three were made with lightweight cotton; the collars on two of them are made from stretch poplin. I made all three of these, from start to finish, in a single day with plenty of time to spare. The one on the left was made using the Colette Sorbetto top pattern. I made the pleat in the opposite direction and lengthened the hem by 3 inches so it’s less of a crop top and more of a flowy boxy top. The armholes are a little tight but nothing too restricting. It’s a great free pattern that I think everyone should make at least one of. 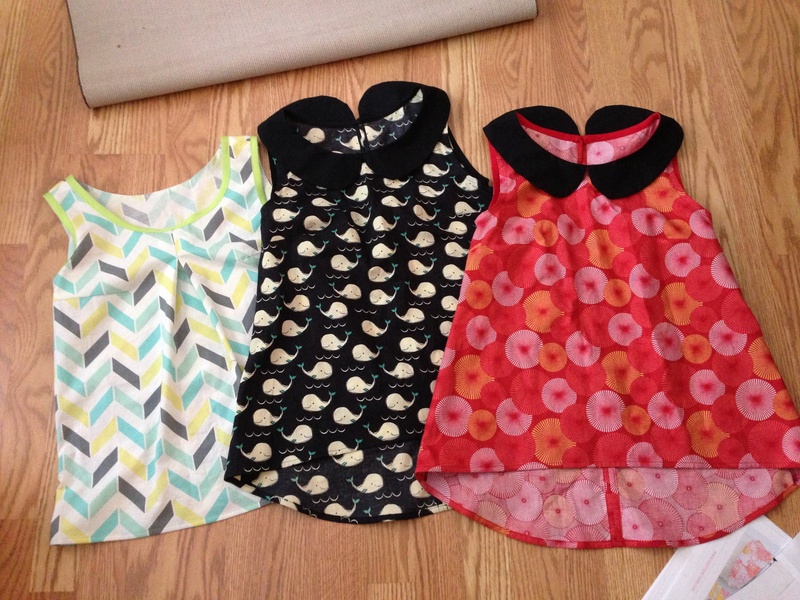 The other two shirts were made from Simplicity 1693. Normally I go into a fabric store knowing what pattern I am going to use and then buying appropriate fabric. In the case of these two shirts, I got the fabric first then stumbled onto the pattern. Like the Sorbetto top, they are a bit tight in the armholes. They are very billowy with the high-low hem but I love them. I think my favorite of the two is the whale one since it’s so cute. Shirt #4 was made in about 2 hours using Burda 7678 and black stretch jersey very similar to the one I used for my knit skirt. I changed the front neckline to be more round and hand finished the sleeves and neckline. The original inspiration for this shirt/mini dress was the Diesel D-Quare-Dev mini dress worn by Lily Collins as Clary Fray in The Mortal Instruments: City of Bones movie. I would probably wear this as more of a billowy shirt with either jeans or tights come fall (all the fabric makes it very warm despite the thin nature of the jersey). As I said before, shirt #5 in incomplete so it’s not shown here. It’s a sleeveless, button/snap down front with a modified high-low hem in a stretch cotton purple and black plaid print. Very cute but unfinished currently. I also made a drapey jersey knit cardigan this morning using Megan Nielsen’s tutorial. The only issues I have with my cardigan is that the shoulders are funky and the sleeves a little tight. 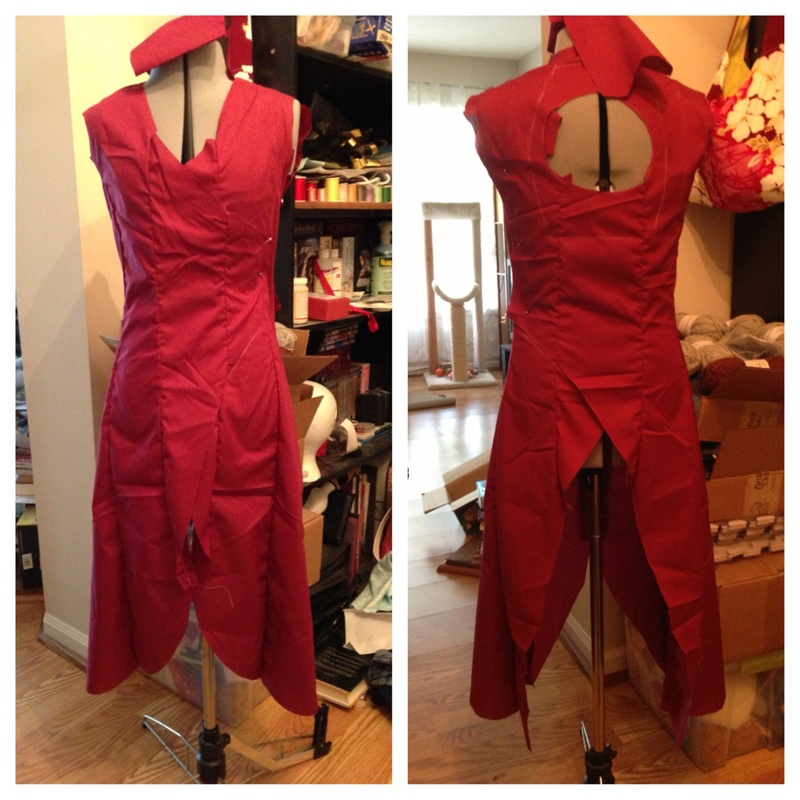 The sleeve issue might be because my fabric isn’t exactly 4 way stretch; the shoulders always come out funky for me. 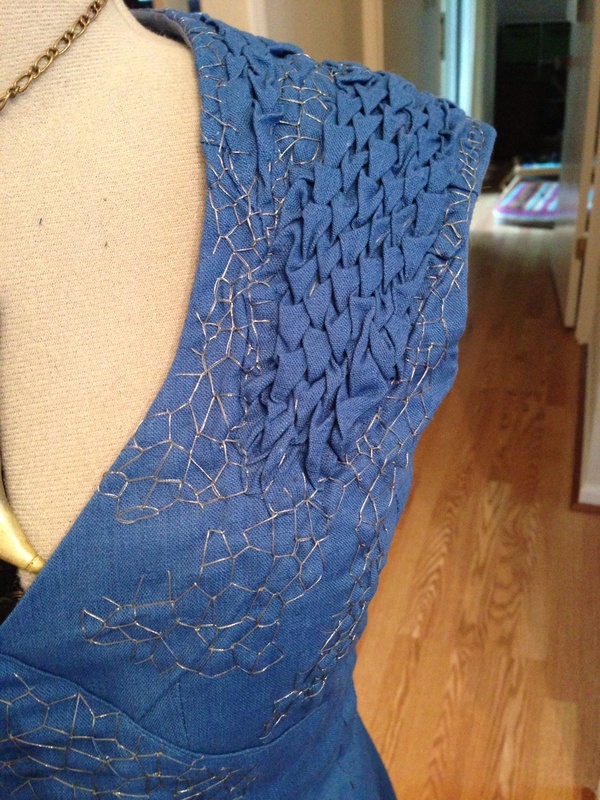 I head back to work tomorrow (oh joy…) so sewing will be a bit slow until Christmas break. I have two cosplays I plan to work on before the year is out so expect some progress on those. I also need to complete some knitting projects that have been sitting around since the weather turned warm. Stay tuned! Hello everyone! If you originally came here looking for “Twilighter’s Closet”, don’t worry. You’re in the right place! My posts have slowly morphed from being about movie replicas to being more about my crafting. 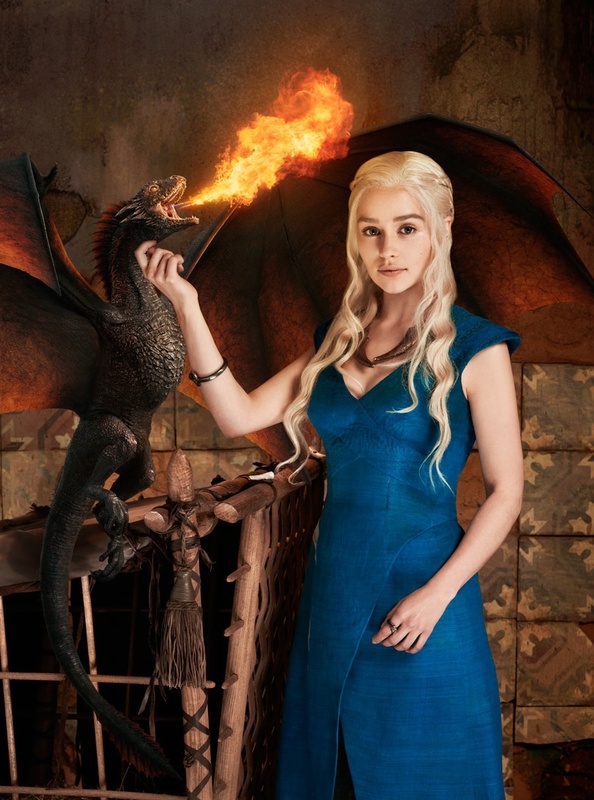 I’ll still include movie replica reviews but Sew Kurafty will be largely about the items I craft. I’ve got some new sewing items to debut soon so look for that, and possibly a review on a Mortal Instruments replica. Stay tuned! Been on a Doctor Who kick lately, and as I have said before I adore the new companion Clara. After sewing her Cold War outfit and assembling the screen accurate pieces of her Nightmare in Silver outfit, I set out to assemble some more of her other outfits. I have all the main pieces except the shoes for her 50th anniversary outfit. And I have plans to work on her Snowmen barmaid outfit. 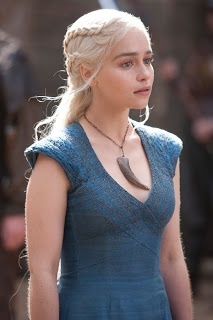 One of the pieces I have wanted for a while is her Bells of St. John red asymmetrical dress. I love the Urban Outfitters Silence + Noise dress, but acquiring it has been difficult. It has been sold out for a while and trying to get it on eBay has been a nightmare. I came close once but never again. Like always, I set out to sew it but what fabric to use? Finding anything close to the space dye pattern was not yielding good results…until a lovely cosplayer on Tumblr kindly told me where she got her fabric. Turns out she got it at Fabric.com (which I frequent) but I just wasn’t typing in the right key words (the fabric has since sold out since other Clara cosplayers also purchased it). 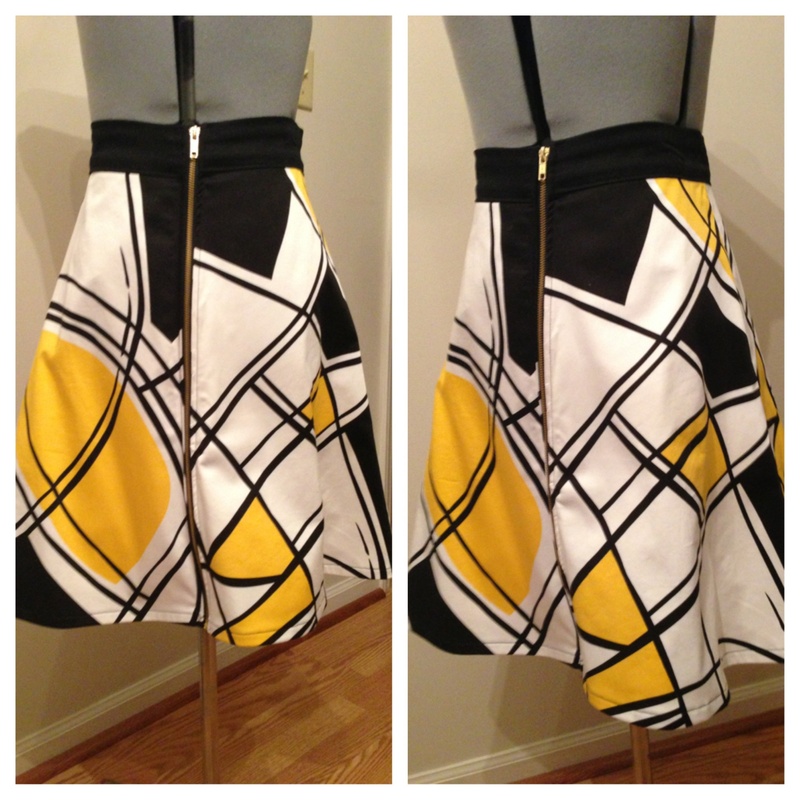 I meshed two patterns together – one of the top and one for the asymmetrical skirt – into a dress. 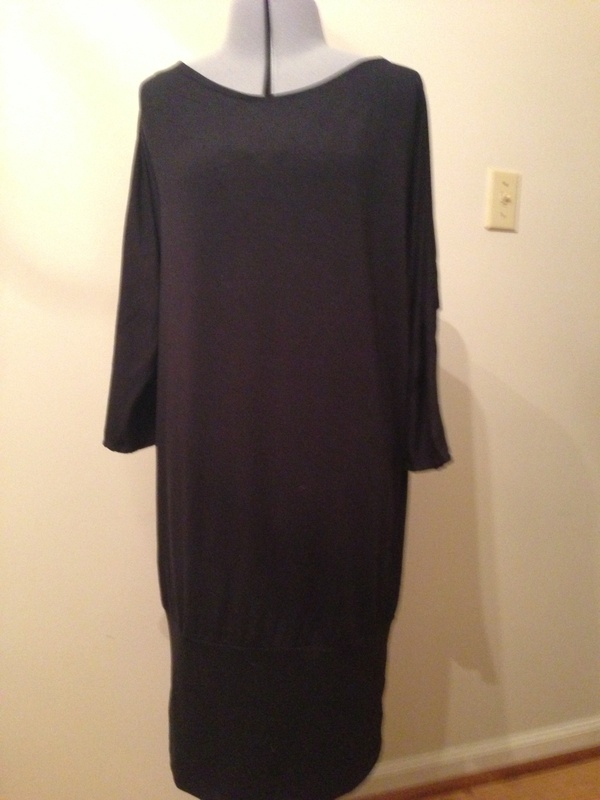 The fabric is stretch knit so no need for a zipper or buttons. The downside to the stretch is that it doesn’t lend itself well to a shaped fit; I’ve taken in the sides and it is still a little loose on me. I haven’t actually worn the dress except to try it on since it is currently pushing 90 degrees F here and cooler weather is way off. Hopefully around October I can make use of this dress. I bought four yards of the fabric and just BARELY had enough. 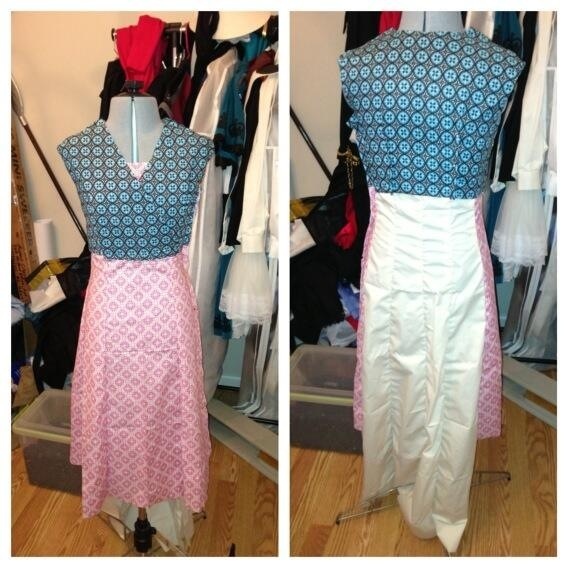 It takes more fabric to complete when you have the horizontal striped top and vertical striped dress. I did this because, after careful study, the original dress had horizontal vs. vertical stripes although the striping of the space dye pattern is more subtle. I don’t have anything for the shoes at the moment; All Saints recently sold out of the non-shearling version of Clara’s boots but they were too pricey for my blood. 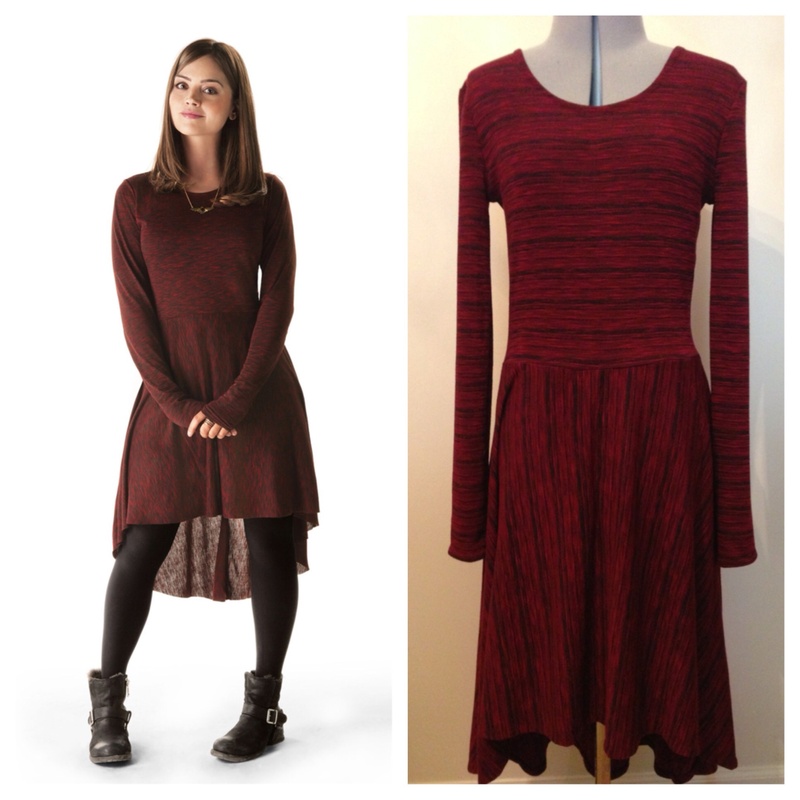 I am still trying to bid on and win/sew Clara’s Rings of Ahkaten and Journey to the Centre of the Tardis dresses since they are two of my favorites. No luck yet on fabric but I am hoping something will turn up eventually.